Daniel Ohrenstein delivered energy efficiency solutions to tenants of the Boston Marine Industrial Park and scoped the feasibility of a district energy system in the park. 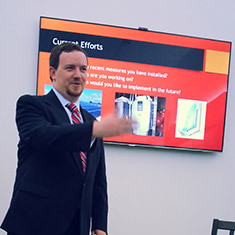 Daniel Ohrenstein was hosted as an EDF Climate Corps fellow by The City of Boston and the Boston Redevelopment Authority (BRA) to deliver energy efficiency solutions to industrial tenants of the Boston Marine Industrial Park (BMIP). Boston’s climate goal is to reduce carbon emissions by 25 percent by 2020 and 80 percent by 2050, and encouraging energy efficiency is central to this effort. Ohrenstein gathered data to scope the feasibility of a district energy system (DES) in the park. In parallel, Boston is exploring the potential of DES’s fuelled by local generation and distribution of cooling, heating and electric. DES’s could curtail building greenhouse gases while enhancing the resiliency of businesses and communities. Ohrenstein engaged with 14 different stakeholders within the BMIP who operate a total of over 3.1 million square feet of industrial and commercial space. These stakeholders operate 18 permanent buildings with a total of 224 different subtenants. Coordinating with representatives from NStar and National Grid, Ohrenstein identified potential energy efficiency projects for BMIP tenants, including three lighting replacement projects and one energy management system project. Further, Ohrenstein held a series of stakeholder meetings to build consensus for the future DES. The final component of the fellowship was to gather BMIP building energy data. From Ohrenstein’s data, Boston is planning to conduct a detailed engineering study of district energy in the BMIP. Daniel Ohrenstein, a student at Cornell University, was hired as the 2014 EDF Climate Corps fellow at the City of Boston Office of Environment, Energy and Open Spaces.